While infrequent, occasionally there may be a need to remove a field from a table. When doing this, it is important to take special care, as data can be lost in the process. Certainly in the case of key fields. If, for example, the Currency key field was removed from our table, the foreign key rela-tionship to the TCURC table would be removed. As the SALARY field has to have a related Currency Key this would cause the table to no longer continue working, and likely make the ZEMPLOYEES2 table become inactive. When deleting fields it is important to ask oneself whether the data being held in the table is being used elsewhere, and whether its deletion will have further consequences. If you do try to delete fields which are being used elsewhere, the SAP system should try to pre-vent this, or at least issue a stern warning. This is not necessarily to be relied upon though, so always ensure to check manually what the effects of deletion are likely to be. 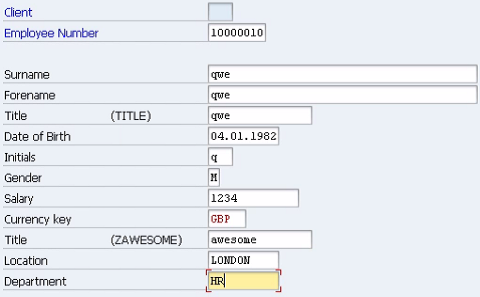 Also, if you do delete fields, the table will have to be adjusted via the SE14 transaction to be acti-vated again. To save time creating new records, the same data was replicated here, with only slight changes to the key fields. Remember that it is only one key field per entry which must be unique for that particularly record to be unique itself. 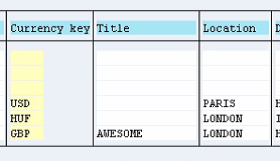 Now, the surname field will be deleted, and the effects of deleting this key field observed. By removing this key field, the only unique data which will be held for each record will be the Employee Number and Client. Since SMITH and SMITH2, and ANDREWS and AN-DREWS-2 have the same Employee Number and Client, these will no longer hold unique key field data, leaving duplicate records, which the system will not allow.